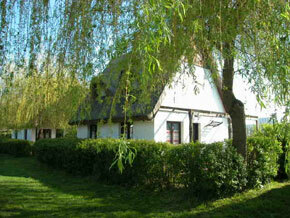 The Kentaur Puszta is a small holiday village built in a traditional Hungarian village style. It is situated about two kilometres from the centre of Balatonboglár and Lake Balaton. The village consists of hotel accommodation, dining and drinking halls, swimming and fun pools, sauna and fitness room, wine cellar, a horse riding arena, stables and a small farm. 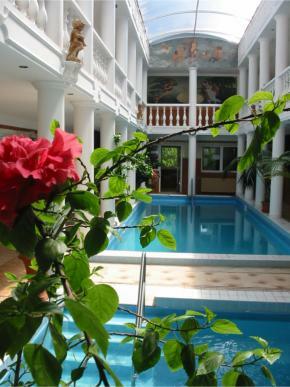 Guests have free use of the indoor and outdoor pools. The Kentaur Puszta Holiday Village is very well suited for people who want a quieter time away from the lake but still be within easy reach of the lakeside facilities. Guests may borrow bicycles free of charge to ride into Balatonboglár and to the lakeside. A taxi ride into Balatonboglár costs about 1000 forint. There are shows and activities most evenings during the Summer. There are goulash parties, wine tasting, dancing to traditional Hungarian gypsy music, pantomime and cabaret, and there are demonstrations of horsemanship. All events are about three and a half hours long and include a meal with wine. Guests staying at the Kentaur receive a discount when buying tickets to the shows. 75 square metre floor area suites. 62 square metre floor area apartments. Completely new building, furnished with antiques. Modern kitchen and bathroom with bath and shower. All have balconies over looking gardens. Communal sitting/reading areas inside overlooking the hall. These are situated above the dining hall in the main building. 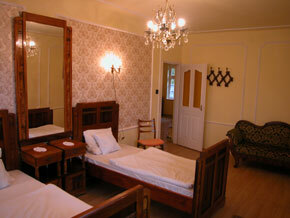 They are fairly basic and simply furnished with old, traditional, Hungarian furniture. The rooms are fitted with single beds. There is a shower room with wash basin and WC. Each room also has a fridge and TV. 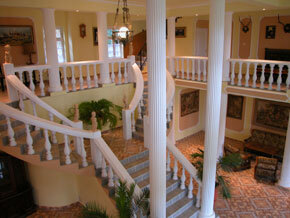 The houses are fairly basic and are simply decorated and furnished in old, traditional Hungarian style. Each house has a simple kitchen, a small living room with TV, double bedroom with single beds and a shower room with wash basin and WC. Meals are taken in the dining hall and the covered outdoor dining areas.